The penalty phase in the Boston Marathon bomber's trial opened in powerful fashion Tuesday, with prosecutors portraying Tsarnaev as a coldblooded killer and "America's worst nightmare." In a front page story in the Boston Globe, the parents of the youngest victim of the Boston Marathon bombing urged federal authorities to consider taking the death penalty off the table for the man convicted in the case. The government then began trying to drive home the horror of the attack in heartbreaking detail by calling to the stand what is expected to be a long line of witnesses who lost legs or loved ones in the April 15, 2013, bombing. "I remember hearing just bloodcurdling screams. I just remember looking around, just seeing blood everywhere, sort of like debris falling from the sky," said Celeste Corcoran, who made her way to the witness stand on two artificial limbs. 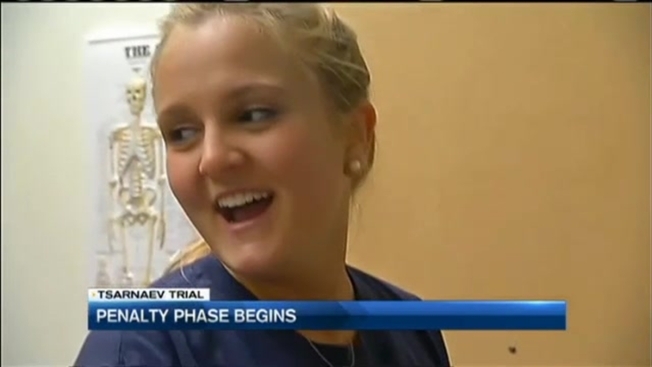 She told the jury that the blast hurled her into the air and left her in such excruciating pain that she wanted to die. "I just remember thinking how awful this was and how this had to stop. This couldn't be real, couldn't be real," she said. Three people were killed and more than 260 wounded in the bombing, carried out by Tsarnaev and his older brother, Tamerlan, to punish the U.S. for its wars in Muslim lands. An MIT police officer was shot to death days later as the brothers tried to get away. Tsarnaev was convicted earlier this month of all 30 charges against him during the trial's guilt-or-innocence phase. His lawyers did not give an opening statement Tuesday but will do so once the prosecution has made its case. Prosecutors have argued that Tsarnaev was a full partner with his brother and deserves the ultimate punishment. "His destiny was determined by him, and he was destined and determined to be America's worst nightmare," Pellegrini said. She described the killings as "unbearable, indescribable, inexcusable and senseless." With enlarged photographs of the victims behind her in the courtroom, the prosecutor told the jury: "They were all beautiful, and they're all now gone." "You know how they died. Now you need to know how they lived," she said. "You need to know and to understand why their lives mattered." About a dozen people protesting against the death penalty demonstrated outside the federal courthouse Tuesday morning. 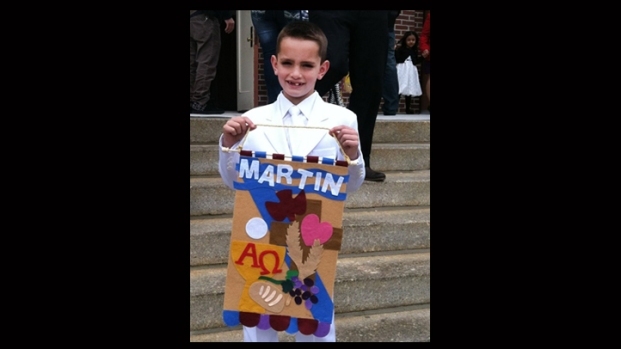 Earlier this week, the parents of the youngest of those killed, 8-year-old Martin Richard, urged prosecutors in a front-page letter in The Boston Globe to take the death penalty off the table. The jury was released for the day shortly before 3:30 p.m.